This bolognese sauce recipe is a variation of the classic Italian sauce. This Italian tomato sauce is perfect dinner served over pasta with just a side salad to complete the meal. Melt the butter in a large saucepan. Add the pancetta, carrots and onions. Stir and cook for 1-2 minutes. Add the beef and brown it over medium heat, stirring occasionally. Add the tomato paste, lemon peel, nutmeg and stock and wine. Partially cover and simmer slowly for 1 hour. Remove from the heat, take out the lemon peel and stir in the whipping cream just before serving. Makes 2 cups, enough for about 4 servings. Serve this delectable Italian sauce recipe on your favorite pasta with a large salad and some garlic bread. The directions call for chopped lean beef, which means beef cut into small cubes, but you can substitute ground lean beef as well. Use red wine if you prefer. It will result in a somewhat heartier taste. You can omit the wine altogether if you want and substitute and extra 1/2 cup of beef stock. Keep in mind though that the wine adds a distinctive taste that will be missing if you omit it. This sauce itself is gluten free but of course regular pasta is not. Serve the sauce over gluten free pasta, or try a healthy alternative like cooked quinoa. 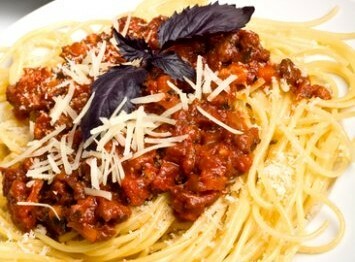 Bolognese sauce is different than the usual Italian tomato sauce. It has very little tomato in it at all. It is definitely worth making as it is quite delicious. This sauce recipe adds a touch of nutmeg and lemon peel for a different flavor, plus 1/4 cup of whipping cream. The whipping cream adds a lovely richness and smooth texture to the sauce. You can however cut some fat from the recipe by using a lighter cream. You can also cut the butter to 1/4 cup instead of 1/3 cup. Bolognese sauces can take hours to cook. This recipe cuts it down somewhat. Just sauté the first few ingredients, then add the rest and let it cook for an hour. Of course, buttery garlic bread served with it would round out the meal perfectly. If you like this bolognese sauce, you may also want to try another of our Italian pasta sauces with a twist, our oven roasted tomato sauce recipe.